Screening of healthy adults for genes that might heighten disease risk must be pursued cautiously, concludes a U.S. panel whose authors include a UW bioethicist. 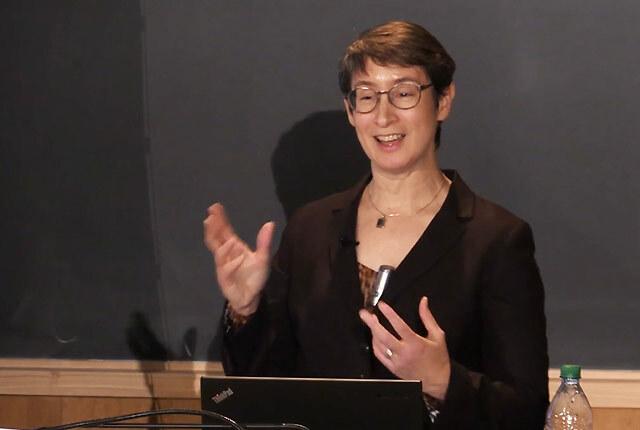 Malia Fullerton discusses genetic testing at a grand rounds presentation in 2016. Programs to screen the genomes of healthy adults to identify genes that may put them at risk for disease later in life need to be implemented with care so that they do not do more harm than good, says an expert panel in a report published Dec. 3. “We need to be cautious and start small and go slow,” said Malia Fullerton, associate professor of bioethics and humanities at the University of Washington School of Medicine. She is one of the paper’s co-authors. The paper was produced under the auspices of the National Academies of Sciences, Engineering and Medicine. Over the past two decades, researchers have identified thousands of variations in genes that appear to increase a person’s risk of developing a disease. In some cases, these links appear strong, but in others the association is weak or not fully understood. Doctors usually test for these changes only when a person is thought to be at high risk for the disease because they have a family history of the disease or already have the disease, in which case knowing the patient’s genetic variant might help guide treatment. Some medical centers, however, are now proposing to screen the genomes of healthy adults who neither have nor are known to be at high risk for a gene-linked disease. The hope is that identifying patients with these variants might inform the development of medications or identify preventative measures such as lifestyle changes. The problem, the panel warns, is that many such screenings will identify gene changes that would never cause problems but their discovery alone may cause the patient worry and lead to more tests and unnecessary treatment. “The more conditions you test for, and the rarer they are, the more likely you are to generate false positives and initiate a cascade of unnecessary follow-up testing and intervention,” Fullerton said. To reduce the risk of such problems, the panel advises that pilot programs begin with screening only for those few genes known to significantly increase risk, or whose connection to a disease is well understood, and for which effective interventions exist. “The number of such genes for whom the risk-benefit analysis of genomic screening pans out is actually quite small,” Fullerton said. genes linked to familial hypercholesterolemia, which is associated with an increased risk of cardiovascular disease. Under some circumstances, such as when a high-risk population is being screened, it may be appropriate to test for genes whose risk is less well-known – if effective interventions are available, the panel wrote. These genes include those associated with hereditary hemochromatosis, which causes cirrhosis, with hypertrophic cardiomyopathy, which causes heart enlargement, and with long QT syndrome, which increases the risk of sudden cardiac arrest. Genome screening programs also need to consider whether screening clinicians will be able to provide patients with adequate counseling and follow-up care, and whether access to these tests and related care will be broadly available. “Such considerations absolutely do not negate the enormous potential for applying genomics in a public health context, but they do imply that a significant measure of caution should be applied as we pursue this exciting prospect,” the panel said. Debra Lochner Doyle, state coordinator for genetics services for Washington State Department of Health and affiliate instructor at the UW School of Public Health, is also a co-author.